Welcome to the first episode of Covers from the Unknown! My first comic to look at is the Salvation Run #7, Neal Adams variant. For anyone not familiar with the Salvation Run series, it was released in late 2007, and early 2008, and ran in parallel with the Final Crisis storyline. For anyone familiar with the tv show Survivor, think DC villians on a deserted island. In my opinion, the only good thing to come out of the storyline was this cover. Any Joker or Adams fan will be sure to add this to their collection. 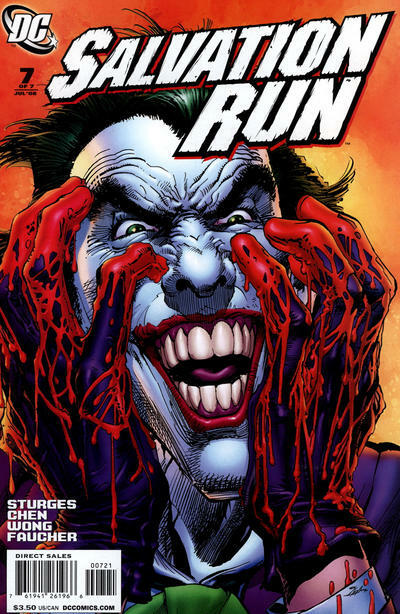 With so many iconic Joker covers, this one ranks right up there. That’s a great cover! I just bought one on Amazon for $9.79 “new in stock bagged and boarded”. We’ll see how that turns out…. Very cool book! I love the idea for this column. Ha! I was about to check out at G Mart and someone snagged it from me. Oh well. Thanks Jason! Sweet looking cover! Had no idea of its existence prior to this article! Wow that is a sick cover. Thanks for sharing this. Thats a great cover! Thanks for sharing. And you thought those covers were hard to find before this write up. Just wait. Great write up, great cover!